Intelligence and IQ scores have been the subject of an enormous amount of research. Over time a number of conclusions has been reached, some of them interesting, some simply funny and some very controversial. Some of these conclusions are listed below. Men tend to score higher than women. This could be in part caused by the fact that IQ tests traditionally measure things at which men are better than women. For example, think about spatial insight and math. If there is more of a balance between things at which both men and women are good, the differences between sexes could disappear. In comparison to the entire population, your IQ score will increase until you reach 'adulthood' and will decrease as you get older. This is simply a consequence of the maturation of the brain and an increasing understanding and vocabulary. As people get older, it becomes more difficult to focus and the quality of their memory decreases. This leads to a decrease in performance, although the absolute decrease is often minor. It will not come as a surprise that people with a higher educational level score higher in IQ tests than people with less education. This is a very charged topic! If you wrongfully assume that intelligence is a matter of genetics only, differences between races could be used to justify racism. After all, Asians on average score somewhat higher than whites in a traditional IQ test. And whites in turn score a bit higher than blacks. Do note, this very likely reflects average educational level and other factors and not race. It is very unlikely that intelligence as it is measured is hereditary only. There are numerous other factors which could explain the differences found. Factors like culturally determined attitude towards work, socioeconomic status, health and educational differences are divided unequally between races. In fact it would be illogical if no differences would be found between races. This might come as a surprise, but there’s a correlation between height and intelligence. Scottish scientists have found taller people to score higher than shorter people, on average. 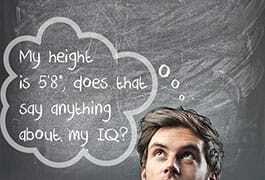 Their research of 6815 people shows there are genes that influence a person’s height as well as IQ score. However, the difference between taller and shorter people isn’t very big. Other factors like educational level are a far better predictor of someone’s IQ score. According to 'popular belief' some nations are not as smart as others. There are many differences in IQ scores between countries. The primary cause is the educational level. The 'higher educated' a country is, the 'smarter' the country is. Although a lower IQ score does not in itself prevent social success, successful people do more often have a higher IQ. Read more on the hereditary aspect of intelligence or take an IQ test.